The Financial Times has launched a preview version its Windows 8 app today, announced earlier this week. The app is available on any mobile or desktop device running the new Microsoft Windows 8 release preview, which went live last night. Tablets running the Windows 8 operating system are expected to go on sale in the autumn. Speaking to Journalism.co.uk earlier this week, Rob Grimshaw, managing director of FT.com said the launch of Windows 8 tablets could be a game changer in the tablet market. "We think it will end up being a much more diverse market place and there is room for at least a couple more big players, and given the effort that Microsoft is putting into Windows 8 it's entirely possible that Microsoft will be one of those players." The FT Windows 8 app, which can be downloaded from the Windows Store, is the "next phase in the FT’s mobile development", the title said today in a release. The FT currently has tablet apps for Windows, Apple and Android, built using a hybrid of HTML5 and native technology. "The same core code base is used to power FT apps for mobile phones, tablets, and desktop and in this case has been combined with the best elements from Windows, optimising the app for devices running Windows 8," the release states. Key features of the new Windows 8 app include: comprehensive access to FT content, automatic updates and offline access. It also allows users to find FT articles using the main Windows 8 search and has "live tile", with the latest FT headlines on the desktop. The app also has navigation allowing FT app the run in part of the screen alongside other programmes, such as email. This means "you can keep track of the news as you work", the FT states. Speaking to Journalism.co.uk for a podcast on why publishers are excited about Windows 8, Daniel Sharp, co-founder of Stonewash, mobile developers that have been working with Microsoft and have launched four apps for publishers as part of last night's release, said Windows 8 offers a number of features he believes will be popular, such as the concept of "full screen snap and fill". "You can run an application full screen and if you then get an email you can push that application to the side and it fills a single column down either the left or the right hand side. That means you can get on with doing something entirely different in the main, leftover screen." Earlier this week Rob Grimshaw, managing director of the FT.com said mobile is increasingly important for the FT, with half of digital access being from mobile devices within three years. In the last six months, readers accessing FT content via smartphone has risen 52 per cent, with tablet reading up 49 per cent. Users will have free access to FT content via the Windows 8 app for a limited period once they have registered, according to the release. Once this ends the app will be integrated into the FT.com access model where after registering, users are able to sample the content before subscribing. Mr Lewis was born in Manchester and grew in Cheshire. After attending the London School of Economics he worked in public relations in the City. He then attended Cardiff University to complete a postgraduate course in journalism. Cardiff is famed for the number of BBC staff it produces, and Mr Lewis followed suit, work as business editor on Radio 4's Today programme. It was after this, in 1999, that he joined Simply Money and then, the Sunday Express. A former colleague at the Express explained that Mr Lewis was not as popular as you might expect given his accessible television persona today, but was a "bit of a geek". "Martin was quite intense, very ambitious and an excellent networker, I am not surprised he has done so well," a former fellow journalist said. It was while he was at the Express in February 2003 he set up MoneySavingExpert – now the most popular consumer finance website in the UK, with 13 million monthly users and seven million people receiving the Martin's Money Tips email – for just £100. While he was still at the Express, in 2007, he was rumoured to have been approached by Lloyds TSB who offered him £5m to buy the site. He turned it down on the basis that he "did not trust banks", and would worry about losing editorial control. Before it was closed down last year, Mr Lewis had a column in the News of the World. He regularly appears on ITV's Daybreak programme, as well as Watchdog and a weekly slot on the Lorraine show. Mr Lewis has a monthly column in The Daily Telegraph. He is a best-selling author, titles include The Money Diet and Three Lessons & Thrifty Ways. Commenting on todays announcement of the sale of his website to Moneysupermarket.com Mr Lewis said that he would be cutting down on the time he spends running the website to concentrate on his media work. The website is being sold for £87m. Mr Lewis owns 100pc of the business and is expected to receive £35m in cash and around 22.1m shares in MoneySupermarket.com. He intends to gift £10m to charity, including £1m which will go to Citizens Advice. Defense Department leaders preparing for historic budget cuts should tap the expertise of their financial management executives, who see the current challenges as their moment to “step up to the plate and shine,” stated a new survey conducted by the American Society of Military Comptrollers and Grant Thornton LLP. With top Defense leaders preoccupied with macro issues, “now is truly a time for all [financial management] professionals to assume a leadership role in meeting the challenges of significantly reduced resources in an uncertain and dangerous world,” an analysis of the survey results said. The survey showed that about two-thirds of financial managers are optimistic about their ability to bring cultural change to reflect the new austerity. But “inertia, resistance to change and entrenched interests that want to maintain the status quo all can work against these efforts,” the survey report said. The most important skills required of modern financial managers are critical thinking, analytical prowess, understanding the operational context of the programs they support, and creating and using performance measures, respondents said. The survey showed a gap between top executives and field managers on some key questions. Asked whether pay and hiring freezes are having a significant impact on the workforce, 77 percent of executives said no, but only 39 percent of lower-level managers agreed. Similarly, the goal of achieving auditable financial statements -- a challenge that has vexed the Pentagon for nearly two decades -- is a higher priority for top-level executives than for field managers. The financial managers were asked which of several approaches top defense leaders likely would take. Options included shifting financial management tasks to nonspecialists; requiring managers to take a 5 percent to 10 percent across-the-board budget cut; negotiating to reduce the number of reports and services required; and outsourcing financial management operations. None of these choices is realistic, the majority of respondents said, but the most likely is an across-the-board cut to program budgets. The number of Hull University students facing financial hardship increased by 54% over the past four years, its union said. The student union said 2,300 students had contacted its advisors for support last year compared to 1,500 in 2008. About 22,000 students study at the university. Four years ago, there were 21,000. The Department for Business, Innovation & Skills (BIS) said "generous packages of financial support" were available. Gina Rayment, from Hull University's student union, said: "They're coming to us with quite serious problems such as possible rent arrears where they could actually lose a roof over their heads." "It isn't just that they need some money for a Friday night, it's actually that they need money for food, they need money to pay their bills and they need money for rent." The union said there were a number of reasons why students were facing hardship including mismanagement of money or loss of parental incomes. "One of the main reasons here in Hull is that there are no part-time jobs that students used to rely on to get themselves through university," said Ms Rayment. The rise in financial hardship has also led to an increase in the number of food parcels it provides to students. Last year the union distributed 70 food parcels to students compared to 30 in 2008, the union said. A spokesperson from BIS said: "There is a generous package of financial support to help with living costs in the form of loans and non-repayable grants. "Our reforms will offer more financial support and lower monthly repayments once you are in well paid work." It's a simple rule but it works. If there are expensive items you want, make a list of them and work out if you really need them, and how you can realistically afford them. Debt is much more common in 2012 but if you rack up a lot of money on credit cards and loans you're probably going to have to pay out a lot in interest. If you're in this situation try a balance transfer card to lower interest payments and if you're coming close to missing your monthly payments ask your provider if it will lower the interest or agree to an interest holiday. Growing your own fruit and vegetables can save money but it takes a lot of planning. Start small, with pots of herbs for example, and try to grow products you know you'll use. The website vegswap.co.uk helps you to swap your homegrown or homemade produce. Money-saving vouchers, coupons and codes can save hundreds of pounds off nearly everything you buy. Today, all these are available online so if you sign up to specific websites, such as vouchercodes.co.uk, you can get a weekly email of the best deals. Newspapers, magazines and supermarket leaflets are also packed full with money-off vouchers. In the 1950s people knew their neighbours. Be it babysitting, dog walking or gardening, by getting to know the people who live on your street you can create a network of people who can help each other out. The website streetbank.com, which you can register with and list the skills you have to offer, is a good place to start. Large sums of money received by Somalia's interim UN-backed government have not been accounted for, a World Bank report says. The report, seen by the BBC, is being circulated at talks in Turkey on how to end Somalia's decades of anarchy. It alleges a discrepancy of about $130m (£85m) in the accounts over two years. UK foreign minister William Hague told the BBC that an international board to oversee the distribution of aid funds needed to be established urgently. Somalia's transitional government mandate expires in August when it is due to hand over to an elected president. The revelations in the World Bank report come as several hundred Somali politicians meet representatives of more than 50 countries in Istanbul to try to win new funding for the long-term reconstruction of country. The report stops short of making specific allegations, but does not rule out corruption as a possible explanation for the missing government revenue funds. "There is a discrepancy in what comes in and there's a lack of accounting of how money has been spent," the report's author Joakim Gundel is quoted by US broadcaster Voice of America as saying. "So that opens naturally a big question mark for sure." The report, which looks at the years 2009 and 2010, also says the transitional government has no real accounting system nor does it publicly disclose financial statements. Contacted by the BBC, Mr Gundel said he would not make any comment about the report until later on Friday. But VOA reports him as saying that the missing millions could significantly bolster Somalia's security without relying on foreign donations. The conference in Istanbul is the second major international gathering this year about Somalia's crisis. In London in February, at talks hosted by the UK government, it was agreed that a financial management board to oversee aid should be established. "The details of this need to be finalised with the government of Somalia - and frankly I was hoping it could be done by now, by this conference in Istanbul - if it is not signed here, well then it needs to signed in the next few weeks," Mr Hague told the BBC Somali Service. Last month, leaders of disparate Somali factions agreed to a timetable that will elect a new president by 20 August, ending the transition period of the interim government. The Horn of Africa country has had no effective central government since 1991, and has been wracked by fighting ever since - a situation that has allowed piracy and lawlessness to flourish. Mr Hague said it was important that those at the conference understood that deadlines were met and that the 18,000-strong African Union force in Somalia was properly funded. "I hope it [the conference] will keep up the momentum, particularly towards a successful and legitimate political process in Somalia, towards making sure that development money can be spent properly and transparently in Somalia... And we'd like to see, of course, the continued success of African Union forces," the UK foreign secretary said. All Somalia's rival groups have been invited to participate in the Istanbul talks, expect for the Islamist al-Shabab group, which joined al-Qaeda earlier this year. Despite facing pressure on a number of military fronts, its fighters control much of the country. In recent months, troops from Ethiopia and the African Union force, as well as pro-government militias, have helped government forces gain territory from al-Shabab but the militants continue to stage attacks in the capital, Mogadishu, and elsewhere. WINSTON-SALEM, North Carolina (Reuters) - Three jurors who acquitted former U.S. Senator John Edwards on one count of taking illegal campaign money for his failed 2008 presidential bid said on Friday there was not enough evidence to convict him of five related federal charges. A mistrial was declared on those five counts on Thursday after the 12-member jury in Greensboro, North Carolina, said it was deadlocked on its ninth day of deliberation. Three of the jurors, including the foreman, said on NBC's "Today" show they believed Edwards was guilty of at least some of the charges brought against him by the government. Edwards, 58, was accused of masterminding a plot to funnel more than $900,000 from two wealthy supporters to conceal his pregnant mistress from his cancer-stricken wife and voters during his bid to win the Democratic nomination four years ago. "I think he definitely had some knowledge of the money, where the money was going," said juror Ladonna Foster. "But he was just smart enough to hide it," said juror Cindy Aquaro, later adding, "The evidence just was not there for us to prove guilt." Jury foreman David Recchion said the government's case took a hit due to the lack of credibility of its chief witness, ex-campaign aide Andrew Young, who once falsely claimed paternity of the child Edwards had fathered with Rielle Hunter. The defense showed that Young made inconsistent statements, benefited financially from a tell-all book about Edwards' affair and pocketed more than $1 million from the cover-up. "I think unfortunately that was probably the key part of the miss for the prosecution," Recchion said of Young's testimony. The jurors said emotions sometimes ran high as the deliberations dragged out, but they started each day with calmness and tried to put their personal feelings about Edwards' character aside. "We actually prayed together as a group," Recchion said. A law enforcement source said late Thursday that Justice Department prosecutors were unlikely to retry Edwards, but no final decision had been made. Foster said she thought the government should try again, while Aquaro said she did not think the first trial was money well spent. But juror Recchion said the campaign finance law itself was flawed. "I think there needs to be some change in campaign finance law before you go through this process, and kind of nailing down what really is and what really isn't a campaign contribution." A conwoman has been going door-to-door pretending she is collecting 'donations' for a two-year-old's gravestone after he fell to his death from a moving car. 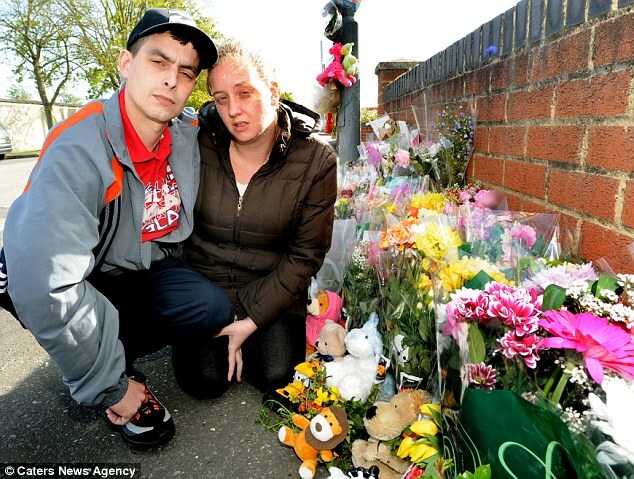 Levi Brailsford's grieving family claimed the woman has been calling at houses across Bristol using the ruse to trick people into handing over cash. 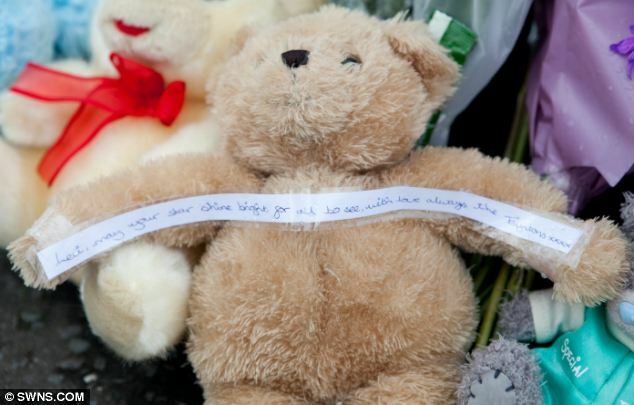 The boy died in Stockwood, Bristol, on May 11 after unbuckling his harness and apparently opening the door of the moving vehicle. 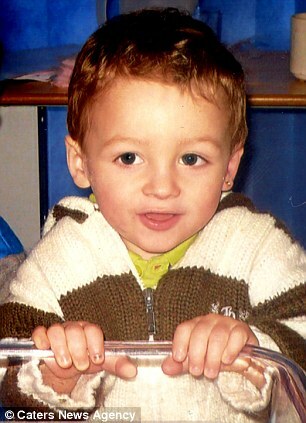 The family, who recently held the boy's funeral, said they have not asked anyone to collect money on their behalf. Residents living in Redland, Bristol, said they had been called by a woman claiming to be fundraising for Levi's funeral and headstone. The boy's family have been contacted by friends with similar stories about a mystery woman asking for donations. Levi's father Kevin said: 'If it was legitimate and the proceeds were coming to us for our son, there would be no problem with it. 'But we haven't asked anyone to do it and for anyone to make any money in my poor boy's name is very upsetting for us all. People shouldn't give this woman any money because we don't know who she is. Jo Broome, who lives in Redland, said: 'A female, reporting to be a "family friend" of the Brailsford family is scouring the Redland area asking for donations to help pay for the funeral and headstone. 'She was very thin, had blondish hair tied back in a very tight ponytail and a very gruff voice. Her complexion was very white looking and she was about 5ft 4ins. 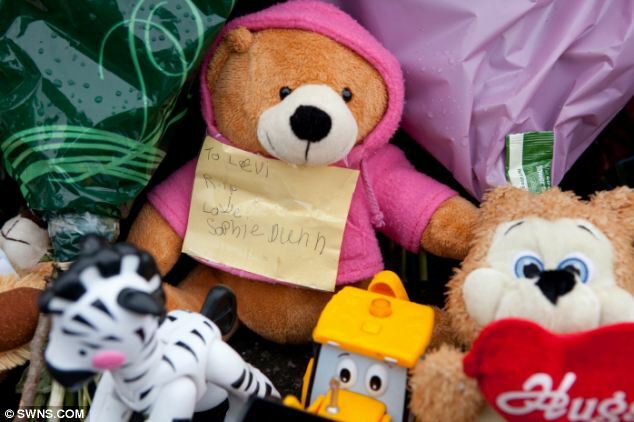 South Bristol Cemetery was packed last Friday as the two-year-old was laid to rest. His father Kevin and mother Andrea, 29, released balloons into the sky, followed by scores more from family and friends. 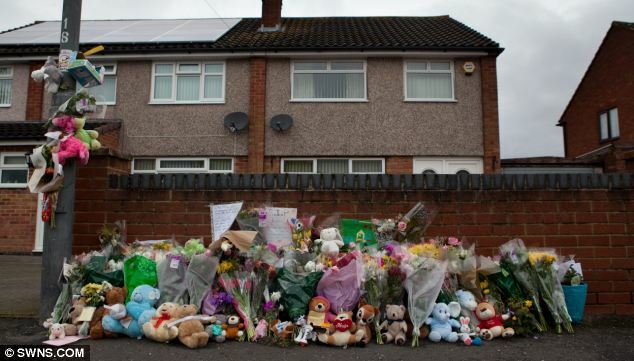 Avon and Somerset Police spokeswoman Claire Stanley said: 'Both police and the family of Levi are aware of a woman who claims to be collecting on behalf of them for a headstone.